E.R. 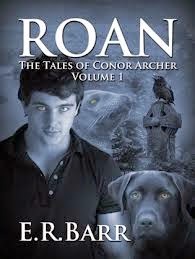 Barr's fantasy debut novel, "ROAN: The Tales of Conor Archer, Volume 1," is a story about 17-year-old Connor Archer's self-discovery and transition to adulthood in Tinker's Grove, Wisconsin, after his young mother passes away from cancer in their Chicago apartment. Barr interlaces the story with Celtic myth, Native American folklore, and modern science, which crafts a unique world and a page-turning epic fantasy. In the beginning, readers are introduced to the evil, black-robed "Piasa," also known as the bearlike Wisconsin River monsters, that have haunted Indians and scare a Mr. Walter Johnson who is fishing for catfish late at night. Then in Chicago on the night of his mother's death, a strange biker greets Connor after his tin whistle gig at the DerryAir bar, gives him "the water of life," and inspects his webbed fingers before biting his hand as an initiation as a "one of dark ones." Next, a lady with a yard of hair sits with him as he soaks his bleeding wound in the Buckingham Fountain, and she knows that the stranger's bite speeds "the change." Before turning into an aged crone, the lady urges him to find "where the willows weep" and drink the "water from another world" to stay alive. Warned about an omen of death, Connor rushes to his mother just in time to hold her before she dies. Connor follows his mother's instructions to go home to Tinker's Grove with her body and find Aunt Emily, but his sickness from the bite overwhelms him. Once he improves, however, Connor must face the challenges of changing into a a shape-shifting Roan and learn about the history of his Irish ancestors. Not only must he grapple with his personal history and development, but he must also find a way to prevent the evil Piasa as well as the villainous Caithness McNabb and Dr. Drake from discovering the powers of the Roan. One of the highlights of the book is E.R. Barr's top-notch writing. The plot is creative and sophisticated, and the author has a unique approach to the typical good versus evil dichotomy by melding myths with modern life. Lastly, Barr embellishes the protagonist's world with appreciable details, and the novel is masterfully edited. This book is a must-read if you are a fan of epic fantasies and of delving into a rich and thoughtfully-crafted world.